It’s not rare to revel in the past. Everyone does it. Young and old alike. Golden glimpses of our youth flirtatiously cling to us as the years go by. What’s more for millennials is that these fleeting moments are not always our own. Instead, they present themselves as rose-colored memories of stories past, usually stemming from the fond moments experienced and recounted to us by our parents and grandparents. It should come as little surprise then, that us millennial sorts are looking to realize such stories, and, if I may be so bold, to outdo them – claiming them for our own. In my case, these take place in Poland before the family could seek refuge abroad from the Soviet communist dominance. But their stories don’t downplay the hardships; rather each amplifies the little moments that made it all bearable. Because, the harder it gets, the more people tend to stick together and help each other pull through. In Poland, that usually meant washing away the beauty of the majestic countryside with vodka shared among companions, as heritage sites gave way to communist architecture and propaganda. To soak it all up? Hearty meals heavy in grains and easy-to-source nutrients were shared, each getting better with the next shot of vodka and the natural consequence of passion-fuelled conversation. Now, decades after the fall of the Iron Curtain, Poland is working hard to restore the nation. In an attempt to reconnect with my roots, I brought seasoned traveler, my mother, to Wroclaw. Often referred to as Poland’s cultural capital, our aim was to experience the Nowa Polska together: one that takes pride in tradition but is eager to experiment and reinvent itself for a vibrant and sustainable future. Our first stop? Patio Restaurant. Venture just steps from the elegant city center, there’s a lot more to it than initially meets the eye. Housed within striking imperial walls that harken to the city’s golden years pre-WWI, it offers much more than room and board for the weary visitor. Specifically, a gloat-worthy dining experience that takes the four seasons out of Polish forests and puts them on to your plate instead: one at a time. 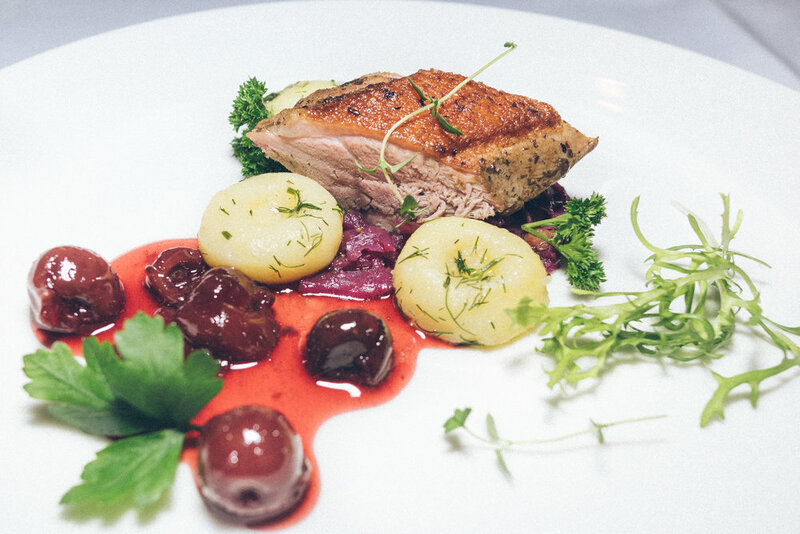 Through classically trained Chef Wiktor Moczek, the renown French culinary standard meets rich and timeless Polish ingredients. For the colder months, think game, dark fruits, root vegetables, and dough for dumplings. This combination is bound to strike a chord in old and young alike. From the first course onwards, my mother couldn’t help but mention how her friends would love this place because each bite simply makes you happy, and each plate provides grounds for great conversation. On the other hand, as a 30-something, it was less nostalgic yet more affirming than anything for me. Quintessential Poland with undeniable artistry and care. Patio is a sign of a change in the times: gastronomy and quality of life are blossoming here. The tasting menu builds, one flavour on another until you’ve experienced what seems like the entirety of the beloved Polish countryside..
It’s brilliant. But you wouldn’t know about this place unless someone told you about it because the hotel is quite unassuming and the restaurant even more so. Off of the central square, nestled behind a historic façade, like so many other institutions, it’d be easy to pass by. Nothing in particular stands out. The décor is subdued and understated but the food creatively speaks for itself. It surprises and delights with each taste. Beginning with a delicate amuse-bouche: the simple yet tantalizing combination of locally-sourced carp graced by a strip of zucchini and a single sun-dried tomato goes a long way. From there, a medley of fruits and vegetables heighten the flavour sensations as each sweet note contrasts with the bitter and base flavors of competing produce. All of which were pulled together with ribbons of pheasant, a nod to feasts from the years of old. At the same time, the waitress, Anna in our case, happily runs-through wine pairings that tease the palate further. Then, the plates came one after another, from onion tarts with flaking pastry to root-vegetable and beet soups. Betweens clangs of crystal and shared spoonfuls of different potages none the less. The mains followed vis-a-vis with duck and pork: cooked to perfection thanks to the French art of sous vide. Yet, undeniably Polish with the addition of black cherries, mini-dumplings or artfully mashed potatoes and red stewed cabbage respectively. The icing on the cake? That’d be the dark fruit compote-turned Brule with a generous pour of Wiktor’s own schnapps to wash it all down (featured above). Travlr Blog says, leave Babcia’s Sunday-best behind and head to Wroclaw’s Patio instead with family in tow, for a rich foodie experience steps from the old town. To discover more of Nowa Polksa, savour diner classics with us at Zenka or check out more of what Patio has to offer via the images below.